As the 18th Shanghai Cooperation Organization (SCO) Summit lifts its curtain this weekend, the world’s spotlight is on the host city Qingdao. 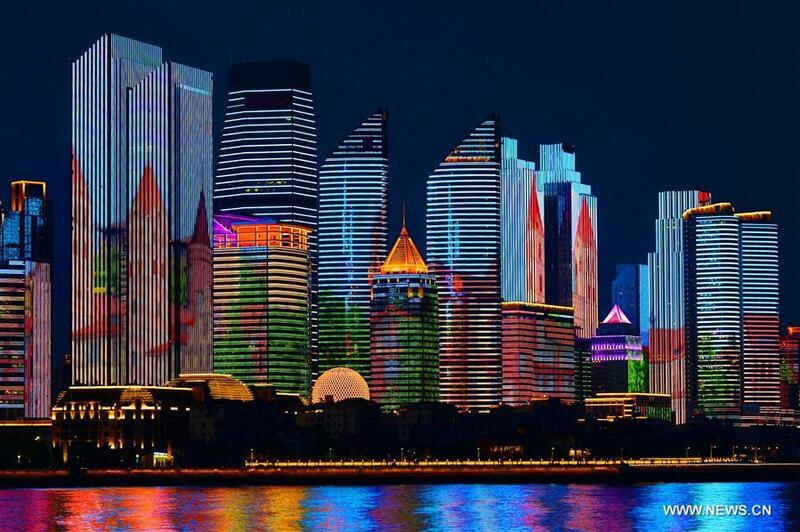 As the 18th Shanghai Cooperation Organization (SCO) Summit lifts its curtain this weekend, the world's spotlight is on the host city Qingdao. As the first event held after the addition of new members to the SCO last year, leaders of the eight SCO member states and four observer states, as well as heads of international organizations are attending. For most member states within the bloc, Qingdao may not be an unfamiliar name. In 2017, Qingdao's total trade with the other seven countries reached 39.02 billion yuan, or US$6.11 billion, up 12.5 percent year on year. Since July 1, 2015, over 3,000 freight trains, loaded with lubricant oil, home appliances and auto parts from China as well as Japan, South Korea and Southeast Asia, have departed from the Jiaozhou Bay International Logistics Harbor in Qingdao for its destinations in Central Asia. Besides Central Asia, Qingdao is also linked by rail with Europe, Mongolia and the ASEAN countries, providing a gateway to the sea for landlocked countries. Zhang Jiangting, secretary of the Qingdao Municipal Committee of the Communist Party of China, said the summit will not only boost Qingdao's tourism, trade, and exhibition industries, but also promote new growth sources and improve the quality of the city's development. According to government releases, Qingdao has invested in over 74 programs in SCO member states, observers and dialogue partners, including home appliance production bases in Russia and India, the Haier-Ruba Economic Zone in Pakistan, Qingjian Group's engineering program in Russia and Xueda Group's clothing production base in Cambodia. SCO member states, observers and dialogue partners have also invested 226 programs in Qingdao, ranging from home appliances, logistics and textile and apparels, with a total contractual investment volume of around 475 million yuan. As of now, the city has established economic cooperation relations with 12 cities (provinces, organizations) with seven SCO member states and SCO dialogue partners within the bloc, including Russia, Kazakhstan, Kyrgyzstan, India, Pakistan, Cambodia and Nepal, the China News Service said in a report. Sun Zhuangzhi, secretary-general of the SCO Research Center at the Chinese Academy of Social Sciences, said that choosing Qingdao as the host city reflects China's efforts to boost the Belt and Road Initiative. Qingdao has both land connection with Europe through railways and maritime connection with other countries, he said, adding that the city plays an important role in building the Silk Road Economic Belt and the 21st Century Maritime Silk Road, known as the two integral parts of the China-proposed Belt and Road Initiative. Historically, the city of Qingdao has long been a major international player. Back in 623 AD, the Tang Dynasty had set up the Banqiao Town in Qingdao, which was the start of the north line of the maritime silk road. At that time, cargo ships loaded with silk, porcelains and tea would set sail to the Korean Peninsula and Japan, traveling a course of route similar to the Greek letter "omega." Since then, openness has been deeply rooted into the city's character and Qingdao has been at the forefront of the country's foreign trade. Today, the city keeps playing a major role in building the Belt and Road. In 2015, Qingdao, in partnership with the SCO Business Council, launched the Eurasian Economic and Trade Cooperation Industrial Park to facilitate business cooperation among the countries and regions involved in the Belt and Road Initiative. To date, the park has attracted investment projects from 26 countries, with a combined investment value of US$4.8 billion. In 2017, Qingdao had a total trade volume of 248.53 billion yuan with countries along the Belt and Road, up by 11.2 percent year on year. "Openness is the biggest advantage of Qingdao's development," said the city mayor Meng Fanli. He said that the city will continue to engage in wide cooperation with the rest of the world in areas like finance, transportation and tourism and consolidate its position as a major trade hub in East Asia.